A Multi-Target consists of multiple Image Targets in a defined geometric arrangement. The position and orientation of each Image Target within a Multi-Target is defined relative to the origin of the Multi-Target, which is at its volumetric center. All of the faces of a Multi-Target can be tracked at the same time because they possess a pre-defined pose relative to Multi-Target origin. This enables the entire Multi-Target to be tracked when any of its child targets has been detected. In this way, a Multi-Targets provides a common tracking reference for its child targets. The corresponding TrackableResult (in this case a MultiTargetResult) provides a common pose, as opposed to the individual status and pose information provided for the individual Image Targets. A Cuboid Target is a simplified Multi-Target which allows developers to quickly create cube or box shaped Multi-Targets in the Target Manager. To create a Cuboid Target, you must specify the dimentions of the cuboid and database where the Image Targets will be placed. Once the Cuboid Target is created, you must specify the images of each of the six sides of the cuboid. The Images for each side are uploaded to the database specified when the Cuboid Target was created. Common uses of Multi-Targets include recognizing and augmenting printed media and product packaging for marketing campaigns, gaming and visualizing products in the environment where the product was intended to be used. Multi Targets can be created with the Vuforia Target Manager using JPG or PNG images in RGB or grayscale. The size of the input images must 2 MB or less. Features extracted from these images are stored in a database, which can then be downloaded and packaged together with the application. The database can then be used by Vuforia for run time comparisons. Multi Targets should be viewed under moderately bright and diffuse lighting. The surfaces of the object should be evenly lit. There are two phases to developing with Multi Targets. You first need to design your target images and then define their arrangement in the Vuforia Target Manager. Alternatively you can define this arrangement in the config.xml file of target's dataset or at runtime. The Multi-Targets sample shows how to implement and configure Multi Targets in an application. You can customize this sample with your own targets and content. The sides that make up a multi-target are image targets. All the quality properties, methods, and measurements for image targets are also valid for multi-targets. Given the 3D geometry of multi-targets, other issues are important, such as depth and geometric consistency. We recommend the depth of the multi-target be at least half the width of the front side. Since multi-targets are detected and tracked as shapes, it is important to highlight that when the object is rotated, Vuforia SDK must find a certain number of features on the side of the multi-target. A cereal box and similar product packages are good use cases for multi-targets. Since MultiTargets are tracked as a single trackable item, performance is substantially improved (compared to tracking multiple single-image targets at the same time). 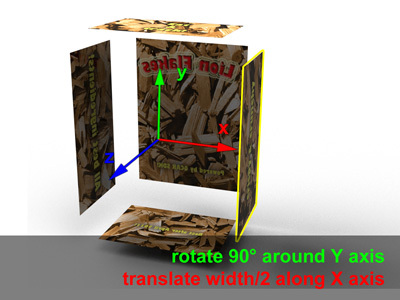 A DVD case is a good example of a 3D object that has small depth. The spine label on a DVD case is usually too thin to find features on it from a distance. So the multi-target would be lost when turning the DVD cover around. In that type of situation, you can detect and track the DVD case by using one image target on each side. By providing for front and back image targets, the user can experience the AR, even if the case is turned over. It is important to guarantee that the spatial relationship among the parts of the multi-target does not change during use. 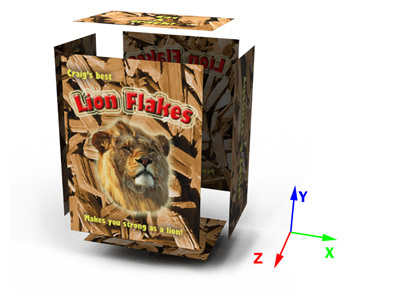 For example, if one side of a multi-target moves when opening the top of the cereal box, the Vuforia SDK assumes the top part is still in place. This inconsistency in use can decrease the tracking performance of the multi-target. To overcome such a situation, leave out the moving target part during creation, or create the moving target as a separate image target. This method allows the application to track a moving part separately (even if ripped apart) without influencing the tracking performance of the multi-target. The parameters of a Multi Target must be defined in the Target Manager when creating a new Multi Target. The following table provides guidelines for defining these values. The parameters of a CoboidTarget must be defined in the Target Manager when creating a new Coboid. The following table provides guidelines for defining these values. Note: The size of the Multi-Target can be changed at runtime. This gives you a flexible way to define or update the scale of the target in your 3D scene. Note: Developers looking to use Multi-Target in combination with Positional Device Tracker should specify the target size in meters.